Alan Moore's new comic Providence is set in 1919 in the New England world HP Lovecraft was creating for his Cthulhu mythos. This is nascent Cthulhu in its very beginnings as it came together in the author's mind. Moore imagines Lovecraft (and various avatars for Lovecraft) travelling around northern Massachusetts gathering folk wisdom, archaeological tidbits and weird historical facts that reveal a secret cult that is attempting to infiltrate the "Old Ones" into human society. I recently read Providence #3 and was pretty impressed by what Moore and his artist, the excellent Jacen Burrows, have set out to achieve. As in Neil Gaiman's American Gods, Stephen King's various Maine based fictions and in Lovecraft's work himself Moore imagines an America overflowing with the supernatural and that supernatural seems to come to a well-head most particularly in New England. As Thomas Hardy did in Wessex HP Lovecraft invented his own personal northern Massachusetts that was a mix of real and imagined towns. 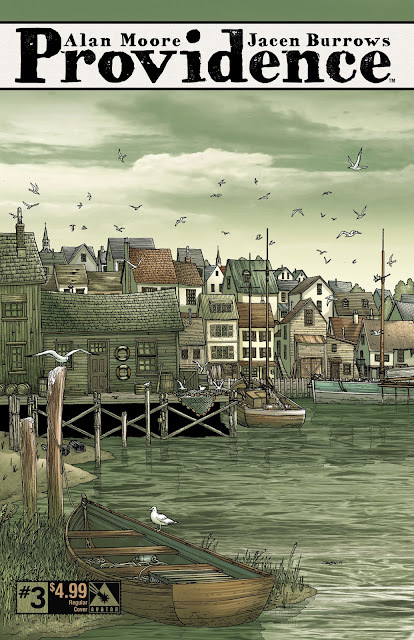 Providence #3 is set largely in one of these towns, Innsmouth, and thus prefigures the famous Lovecraft story Shadow Over Innsmouth. This being an Alan Moore comic we also get J Edgar Hoover, the women's suffrage movement, prohibition, the 1919 Equity Actors strike and a very odd, gothic and terrifying dream sequence where images from the future WW2 leak into the present relatively peaceful 1919. I think this is the most ambitious thing Alan Moore has done for years and the comic is beautifully produced, drawn and lettered. There are sly references to many other fictional characters in Lovecraft's world and the occult stylings of other writers including homages to Gaiman, King and even True Detective. If I have one complaint about Providence #3 its this: Moore has set his fictional Innsmouth in the wrong place. He's put it south of Cape Anne in Salem. Sure Salem is a resonant name but it's simply wrong for Innsmouth. 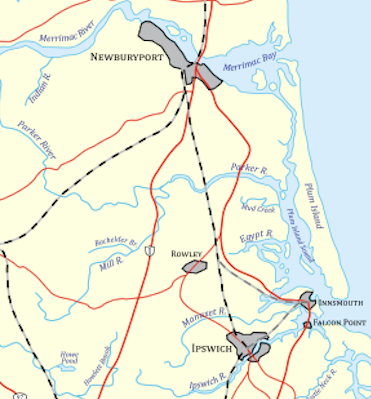 Innsmouth is said to be on the water close to Ipswich and Rowley and just south of Newburyport. Salem is nowhere near Newburyport, Ipswich or Rowley. I spent every summer on Plum Island, Massachusetts from 1992 - 2009 so that part of Massachusetts is an area I got to know very well indeed. And if you've read Shadow Over Innsmouth (I read it for the very first time in the Newburyport Public Library where the hero of the story goes to find out about Innsmouth!) you'll know that the island with the tricky reef just off the coast where the demons live can only be Plum Island itself. In all the summers and a few winters I spent on PI I never noticed any fish people, undersea demons or Cthulhu himself but that's not surprising because Ph'nglui mglw'nafh Cthulhu R'lyeh wgah'nagl fhtagn*... If by R'lyeh Lovecraft meant Rowley then Cthulhu is probably hanging out at this place if he's got any sense. Still, this griping about the location of Innsmouth aside, Providence is a fine piece of work up there, I think, with the best of Alan Moore.